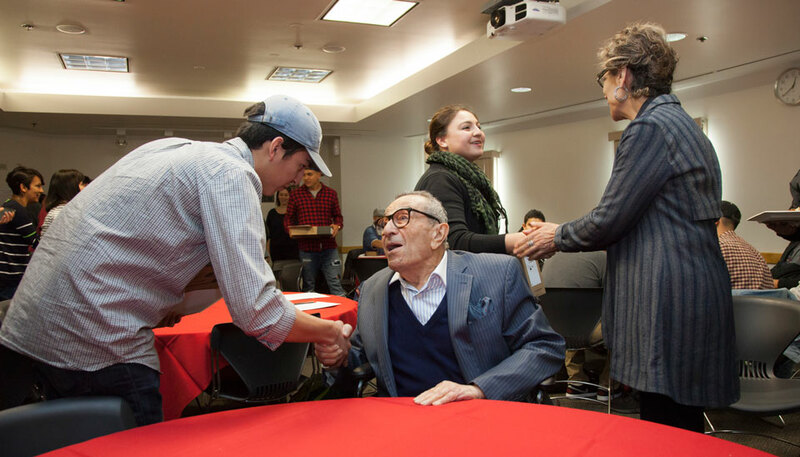 CSUN business law senior Bulmaro Garcia, 27, poses with philanthropist and business titan Younes Nazarian (left), at a Dec. 5, 2016, luncheon in Juniper Hall. 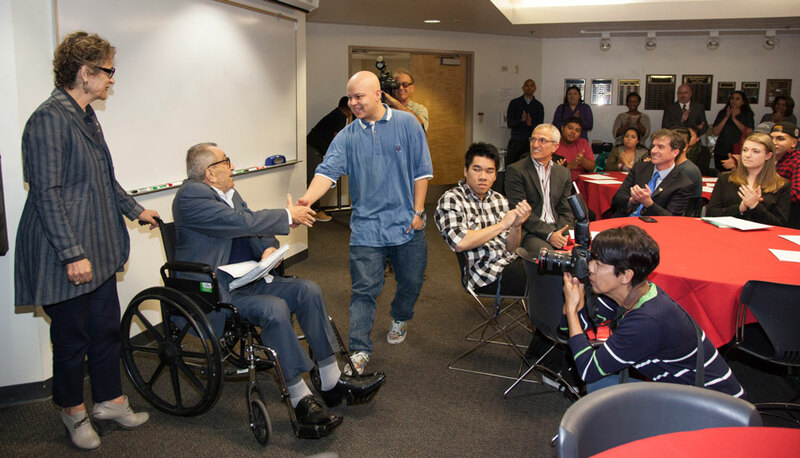 Garcia was one of 50 CSUN business students who received laptops from the Y&S Nazarian Family Foundation. Younes is co-founder of Qualcomm and a pioneer of the global wireless revolution. Photo by Lee Choo. 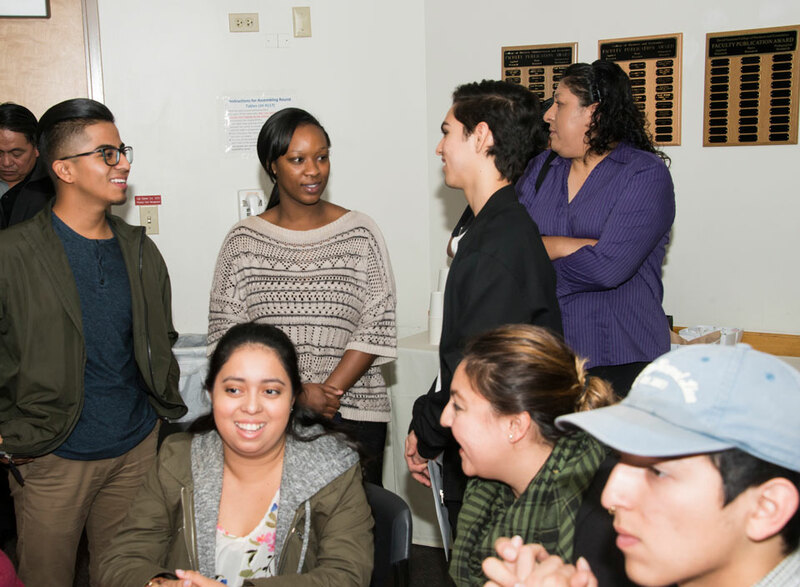 CSUN business law senior Bulmaro Garcia, 27, thanks philanthropists Soraya (left) and Younes Nazarian, at a Dec. 5, 2016, luncheon in Juniper Hall. Garcia was one of 50 CSUN business students who received laptops from the Y&S Nazarian Family Foundation. Younes is co-founder of Qualcomm and a pioneer of the global wireless revolution. Photo by Lee Choo. 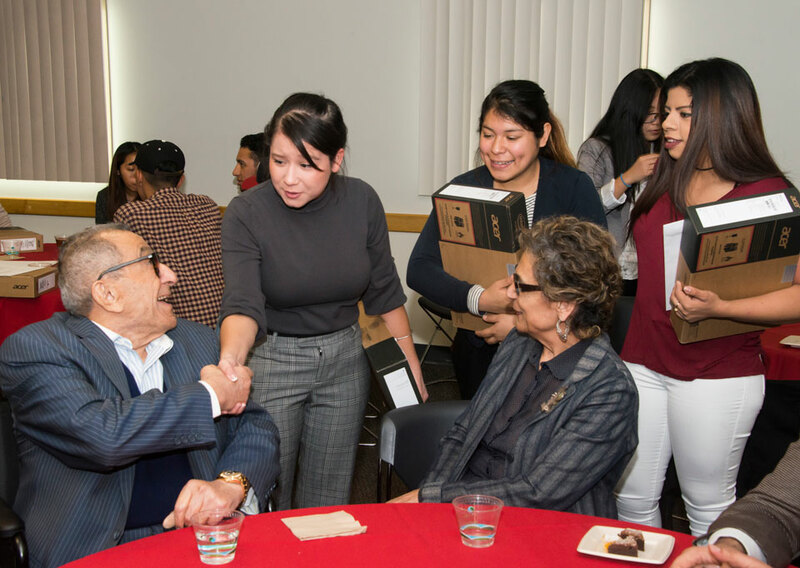 CSUN business students thank philanthropists Younes Nazarian (seated, center) and Soraya Nazarian (standing, right), at a Dec. 5, 2016, luncheon in Juniper Hall. 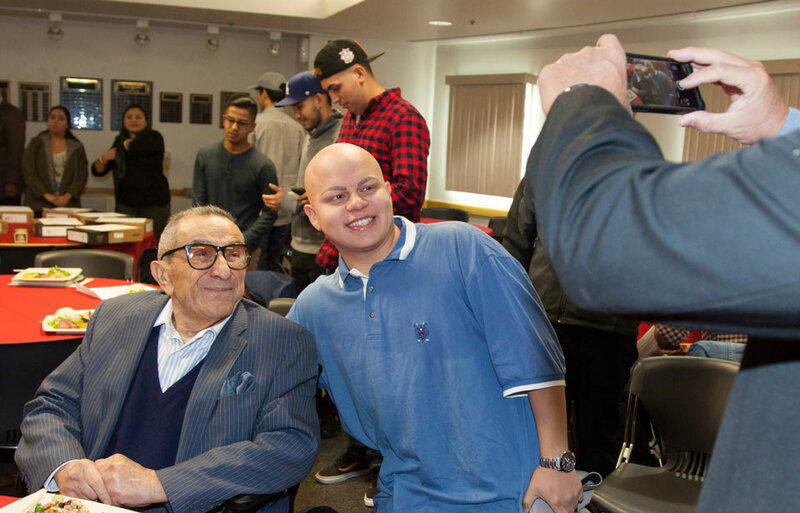 50 CSUN business students received laptops from the Y&S Nazarian Family Foundation. Younes is co-founder of Qualcomm and a pioneer of the global wireless revolution. Photo by Lee Choo. 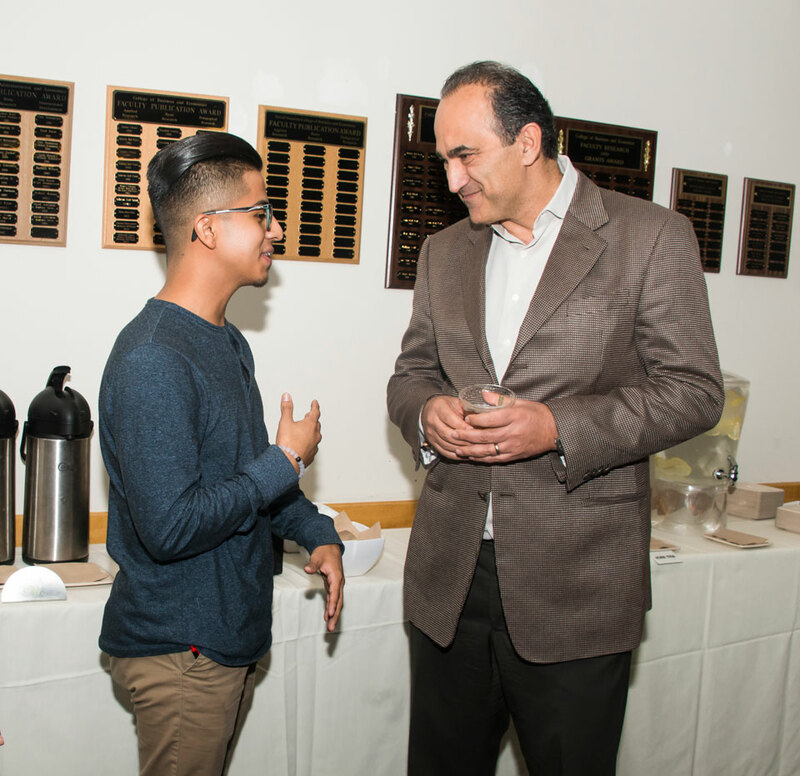 CSUN alumnus David Nazarian (right) speaks with a student in the David Nazarian College of Business and Economics, at a Dec. 5, 2016, luncheon in Juniper Hall. 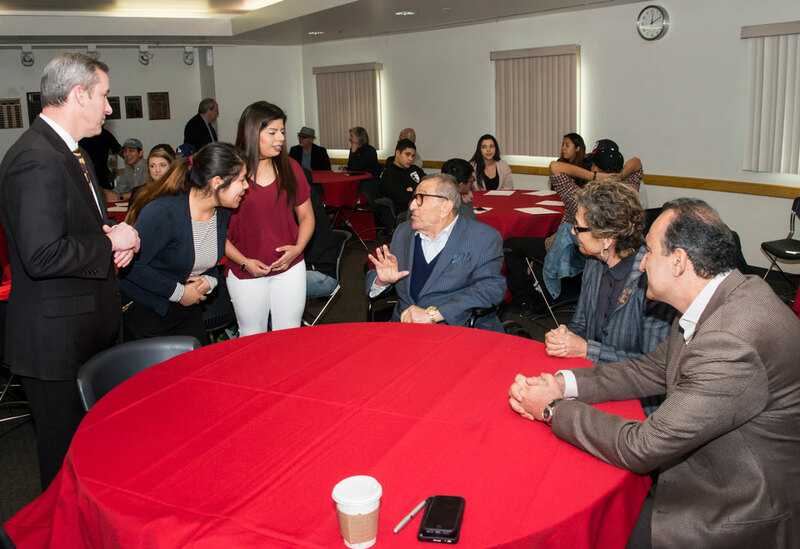 The student was one of 50 CSUN business students who received laptops from the Y&S Nazarian Family Foundation, the foundation of David's parents, Younes and Soraya Nazarian. Younes is co-founder of Qualcomm and a pioneer of the global wireless revolution. Photo by Lee Choo. Business law senior Bulmaro Garcia slid the slim, blue laptop out of its protective sleeve and cracked it open for the first time. The shiny, compact laptop is all his and brand new — just like the California State University, Northridge diploma that Garcia, 27, expects to accept at the David Nazarian College of Business and Economics commencement ceremony this upcoming May. Garcia, who starts final exams this week and has just one more full semester remaining before he completes his Bachelor of Science degree, was one of 50 CSUN business students who received laptops from the Y&S Nazarian Family Foundation. The Dec. 5 luncheon and celebration included remarks from — and selfies with — the local foundation’s founders, philanthropists and business titans Younes and Soraya Nazarian. Younes is co-founder of Qualcomm and a pioneer of the global wireless revolution. Garcia said he expected to start using the new laptop immediately, not just for finals and schoolwork in his last semester, but for his law school applications. The San Fernando Valley native said he hopes to pursue a career in immigration law or work to prevent housing discrimination. Garcia’s mentor, Tony DeFelicis of WE LIFT LA, accompanied him to the ceremony and snapped photos of his mentee receiving the laptop from the Nazarians. DeFelicis also is program director of WE LIFT LA, a nonprofit that works with young adults who have aged out of the foster care system, to achieve independence through consistent, transformative relationships and services. Many CSUN students cannot afford to purchase laptops and must rely on computer labs and other public computer resources to complete their school work. The new laptops will make college life a little easier for deserving CSUN business students, who were selected based on need. Before the laptops were distributed to the students Dec. 5, Younes Nazarian spoke to the students and shared a bit about his own youth in Iran. “It’s so nice to be here with family,” he said, smiling. “My name is Younes — David’s father. I’m so happy to see all of your faces, especially with all the smiles I see here. 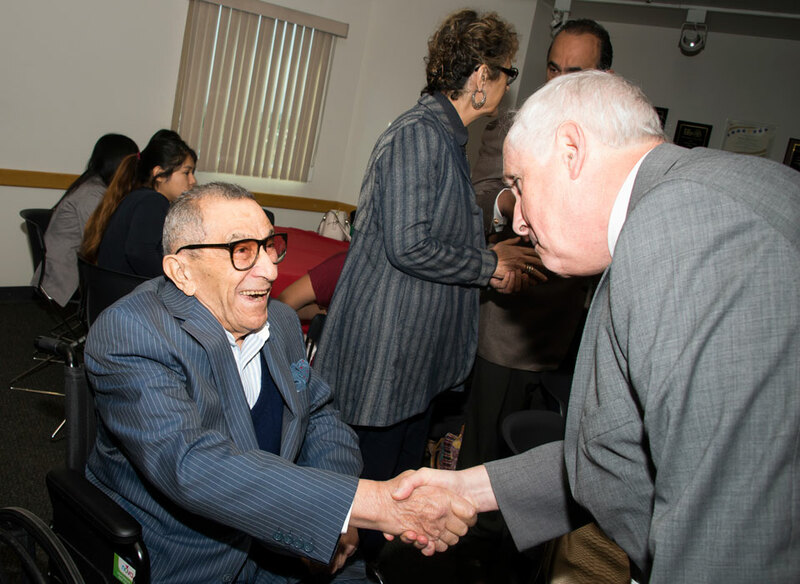 Like the grandfather he is, Nazarian then shared a story — a life lesson — with the students, faculty and university leaders in attendance, who included Nazarian College Dean Kenneth Lord. Nazarian recalled how he had to get an afterschool job at a very young age, after the death of his father, to help support his family. He sold lamps from a cart on the streets of Tehran. “My grandchildren call me Grandpa Lampi,” Nazarian said, drawing laughs from the crowd. He explained that a customer once rewarded him with a very large tip, for hard work and honesty. 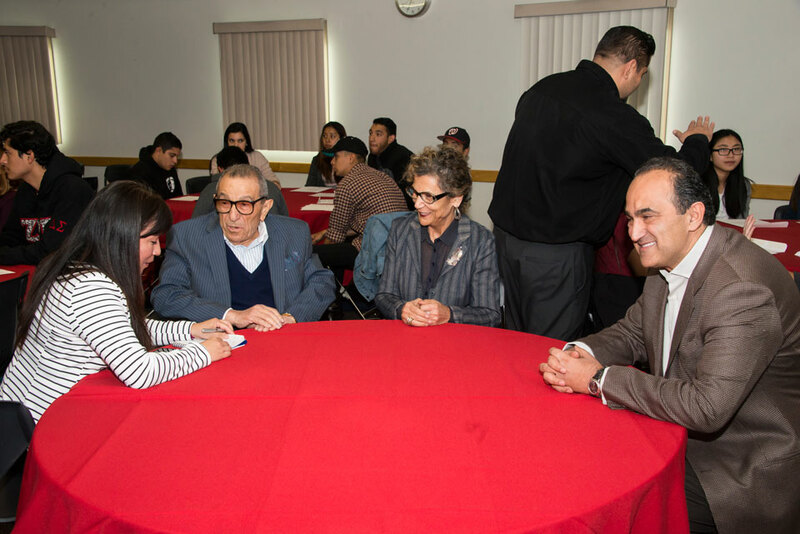 The Nazarians’ son, entrepreneur, philanthropist and CSUN alumnus David Nazarian, founder and CEO of Nimes Capital, joined his parents at the event in Juniper Hall — and he chatted with and congratulated many of the students, in the college that was renamed in his honor in 2014. The Nazarian family recently helped the Nazarian College conclude a $25 million campaign after just two years. The campaign launched in March 2014 when David Nazarian, who received a bachelor’s degree in business administration from CSUN in 1982, donated $10 million of his own money and pledged to help raise an additional $15 million for the college. The campaign’s goals included providing substantive support for the college’s programs. 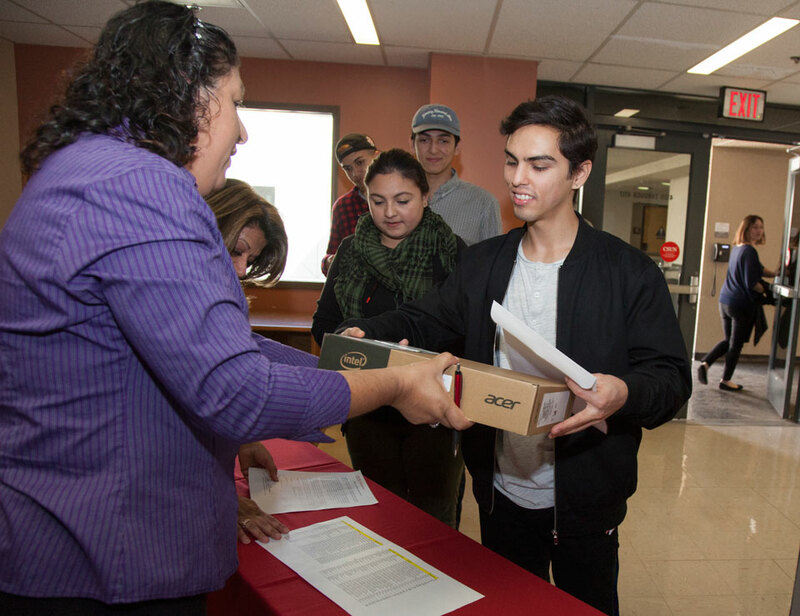 The donated laptops are intended as tangible, instant assistance for current students as they pursue their degrees, said Robert Gunsalus, vice president of University Advancement and president of the CSUN Foundation. “Younes and Soraya Nazarian and their family fled Iran in 1979 and came to the United States — they lost nearly everything when that happened,” Gunsalus told the crowd of business students. “Younes and Soraya have thrived here in the United States, through their tenacity, their hard work, their entrepreneurship, through overcoming obstacle after obstacle. They didn’t speak the language, they didn’t know anybody — and yet here they are, decades later, tremendously successful. I know many of you in this room have overcome obstacles as well. The laptop distribution is a pilot program, and officials hope to expand it in the future.